BLOOMINGTON, Ind. – No. 2 Ohio State (6-0, 2-0 B1G) steamrolled the Indiana Hoosiers (3-7, 0-3 B1G) in University Gym’s final collegiate wrestling match, departing with a 43-3 win. Half the Buckeyes pinned their conference foe. The five falls are the most by Ohio State in a dual since racking up a half dozen pins on Nov. 22, 2016 against Cleveland State. Rather than ending the dual, the big fellas got it started Friday night in the Hoosier State. Heavyweight Chase Singletary immediately locked in a tight cradle to begin the second period, hearing the slap of the mat just 13 seconds in. His fourth pin of the season came at the 3:13 mark and gave Ohio State an early 6-0 edge. True freshman Malik Heinselman peeled off his redshirt and took the mat at 125 pounds. The Colorado native was pitted against three-time NCAA Qualifier Elijah Oliver. The two sparred through a scoreless first frame and period number two included a lone escape for Oliver. Heinselman elected to begin the third in the bottom position and evened the tally at 1-1 with an escape of his own. With 1:15 left to go, he then posted a go-ahead takedown (see video below) and ultimately emerged as a 3-2 victor in his first career varsity action. Luke Pletcher made it two decisions in a row for OSU, topping Garrett Pepple 7-3 in the 133-pound clash. It marks Pletcher’s 15th triumph of the season (15-1). 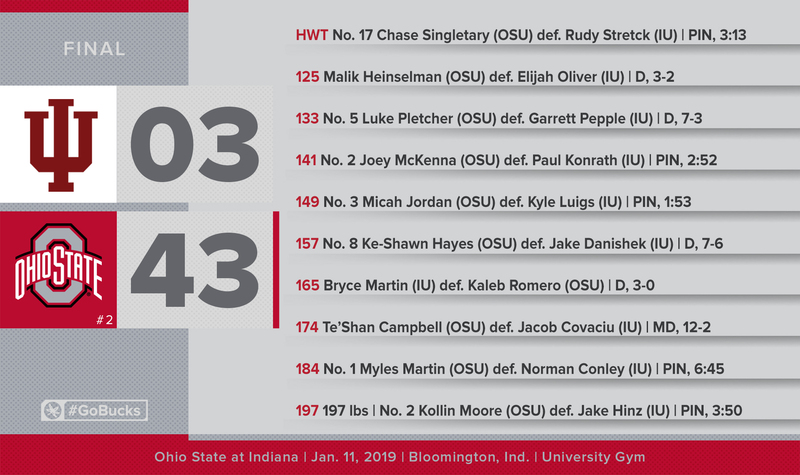 Joey McKenna and Micah Jordan followed with first-period pins to inflate Ohio State’s intermission lead to 24-0. McKenna built a 14-2 advantage before sticking his opponent while Jordan had held a 12-2 lead when putting Kyle Luigs on his back for the final time. The next two bouts were ultra close. First a 7-6 squeaker for Ke-Shawn Hayes (157 lbs), and then Indiana’s Bryce Martin (165 lbs) earning a 3-0 victory. Hayes jumped ahead 4-1 early, but eventually needed to escape with less than a minute remaining to secure the win. Te’Shan Campbell improved to 8-2 during his senior campaign, garnering a 12-2 major decision over Wisconsin transfer Jacob Covaciu. Campbell has picked up bonus points in 5-of-8 wins (this major decision and four previous tech falls). Myles Martin and Kollin Moore tacked on two more falls to conclude the contest. Martin’s pin came at 6:45 while Moore ended it in the second period. Ohio State returns to Columbus and St. John Arena for a 2 p.m. tilt on Sunday (Jan. 13) versus Michigan State.